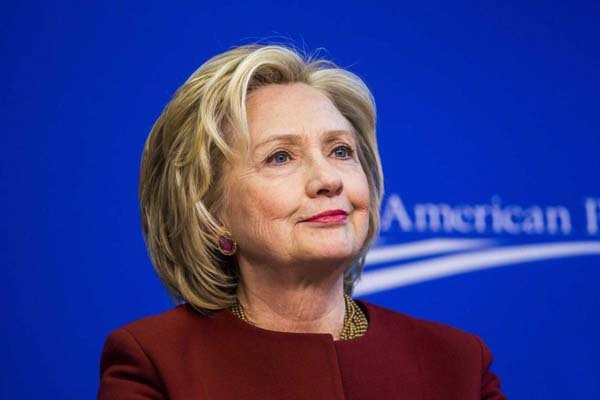 NEW YORK, June 8 (APP): Former US Secretary of State Hillary Clinton marked her place in American history Tuesday night, declaring victory in the Democratic presidential race. “Thanks to you, we’ve reached a milestone,” she told cheering supporters in Brooklyn, a borough of New York City, saying for the “first time in our nation’s history” a woman would lead a major-party ballot. Clinton hit the magic number of 2,383 delegates needed to clinch the nomination on Monday night, as news organizations called the race for her based on support from superdelegates ” party leaders and elected officials who have a vote at the convention and pledged to back her over his party rival, Senator Bernie Sanders. Clinton waited until six states held a final round of contests Tuesday to declare victory, which will solidify her lead in pledged delegates earned through primaries and caucuses as well as her advantage in the overall popular vote. Clinton picked up an easy win in New Jersey and also claimed victories in New Mexico and South Dakota. Sanders, meanwhile, was projected the winner in the North Dakota caucuses. Pre-primary polls showed a tight race in California, the biggest prize on the primary calendar, though early returns showed Clinton in the lead. Montana also held a Democratic contest Tuesday. Clinton celebrated with supporters at Brooklyn Navy Yard and highlighted the historic nature of her win. A video that played prior to her speech spliced images of pivotal moments in the fight for women’s equality in the U.S. ” from the suffragettes and the women’s liberation movement ” with shots of her climbing stairs to address supporters. The White House released a statement late Tuesday night saying that President Barack Obama called both Clinton and Sanders, congratulating them “for running inspiring campaigns” and Clinton for hitting the magic number of delegates needed to secure the Democratic nod. The statement also said Clinton and Sanders would meet at the White House on Thursday. An endorsement of Clinton by the president is expected as early as this week. But Sanders has vowed to fight all the way to the nominating convention in Philadelphia, yet he is already coming under pressure from party officials to concede ” the way Clinton did in her campaign against then-senator Barack Obama in June 2008 ” with Clinton’s lead over Sanders more than double the advantage Obama had at the same time. Former US Secretary of State Hillary Clinton marked Clinton also blasted Republican presumptive nominee Donald Trump and saluted “the extraordinary campaign” Sanders mounted. “Let there be no mistake: Sen. Sanders, his campaign and the vigorous debate about how to raise incomes, reduce inequality, increase upward mobility have been very good for the Democratic Party and for America,” she said. “It never feels good to put your heart into a cause and a candidate you believe in and to come up short,” she said. “I know that feeling well,” Clinton said to laughter. Clinton’s win in the Democratic race marks a historic moment in American politics. From Pakistan’s Benazir Bhutto to Sri Lanka’s Sirimavo Bandaranaike, to India’s Indira Gandhi to Britain’s Margaret Thatcher and Germany’s Angela Merkel, many other nations have elevated women to their highest office. Yet the United States has been slow to do the same, with Clinton’s presumptive nomination coming exactly 100 years after the first woman, Jeannette Rankin, was elected to Congress. “The U.S. has fallen far behind other countries in women’s political engagement in particular,” Terry O’Neill, the head of the National Organization for Women, the nation’s largest organization of feminist activists, said. “We have huge barriers to women achieving these positions in the United States,” with only 20% female representation in the U.S. Congress, she said. Polls suggest a matchup with Trump could be close, with Clinton ahead by just 2 points in the RealClearPolitics polling average, though Democrats are hoping the former secretary of State can increase her margin as the party unites behind a single candidate. That could depend on the tone that Sanders takes and whether his passionate, but disappointed, supporters begin to view the election as a referendum on Trump. “I wish she could see her daughter become the Democratic Party’s nominee,” Clinton said. House Minority Leader Nancy Pelosi, a Democrat, made an appeal to Sanders after announcing her support for Clinton on Tuesday morning. “Bernie knows better than anyone what’s on the line in the election and that we at some point have to unify as we go forward,” Pelosi said on ABC’s Good Morning America.